Arrive in West Hartford, CT and take some time to stretch your legs, shop the quaint little town and grab some lunch on your own before meeting a local historian for your first Ghost Hunting excursion. 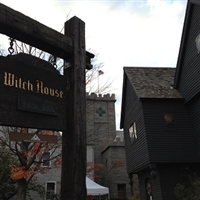 Passengers will venture into some of Connecticut's most haunted structures including the Huguenot House, Godwin Schoolhouse and Blacksmith Shop. After trying to capture some spirits by taking flash photos passengers will enjoy a traditional New England dinner coupled with Yankee hospitality at the Public House Historic Inn. The Inn dates back to 1771 and has hosted both George Washington and Benjamin Franklin. Guests will stay at the Best Western North Shore in Danvers, MA. Enjoy expanded continental breakfast at your hotel before departing for the Salem Witch Trials Memorial for the 20 victims of the witch hysteria of 1692. Passengers will then experience a live performance of a 1692 witch trial followed by a tour of the below ground cells where the accused were held at the Witch Dungeon Museum. Take time for lunch on own at Pickering Wharf in Salem where you can enjoy the many seaside restaurants and shops. Then set sail on the Boston Harbor Islands Cruise. Tour the Boston Harbor Islands, Georges Island and then take a guided tour of Fort Warren - active from 1847 to 1947.Learn about the legendary spirit of "The Lady in Black," the ghost of a prisoner's wife who is said to roam the corridors. After touring, take time to explore Boston's famous Faneuil Hall/Quincy Market. With included vouchers, passengers can enjoy a light dinner and dessert at this historic center. The array of food is delightful and the atmosphere is like a gourmet food court in an historic setting. Enjoy expanded continental breakfast at your hotel before departing for New Hampshire's Scenic Coastal Route - one of New England's top ten scenic roadways. Visit Portsmouth's Haunted Waterfront & Lighthouse Tour to hear the stories of lost loved ones at sea, lighthouse keepers and ghost ships. Take in spectacular ocean views as you learn about the ghostly tales of the historic lighthouses. Enjoy lunch and shopping on own in downtown Portsmouth. Stop at Zorvino Vineyards for a tasting of some "Wicked Good Wine" before ending the day with a Ghostly Dinner at the 1741 Country Tavern Restaurant, where you may enjoy the resident spirit of Elizabeth Ford. Enjoy expanded continental breakfast at your hotel before departing for the Governor Sprague Mansion. The mansion, rich in history, is where spirits are said to remain to this day and where the murder of Amasa Sprague changed RI Judicial history! The tour continues with a haunted lunch at Tavern on Main, with spirited company. This Colonial era establishment where at least four spirits have been seen and heard. A witness will tell you all about it! After lunch, meet your ghost host and discover all the haunts of Mystic on the Seaside Shadows Tour - hear about ghostly apparitions, paranormal activities, spooky tales and active spirits from the 1600s to the present. Dine on your own at Olde Mistick Village, then check into the Quality Inn, Mystic, Ct for a one night stay. Enjoy expanded continental breakfast before checking out and heading home from a ghostly good time! Deluxe Motorcoach Transportation, four continental breakfasts with hot choices, one HAUNTED tavern lunch, three dinners, and admission to the following attractions - Ghost Hunter Tour, Salem Witch Trials Memorial, Witch Dungeon Performance & Museum, Boston Harbor Islands Cruise & Tour, HAUNTED Water-front & Lighthouse Tour, Zorvino Vineyards, Governor Sprague Mansion, and SPIRITED Seaside Shadows Tour.